Any hotel/hostel in central La Paz. Click HERE to view pick-up area. Note: If staying outside this area (e.g. Sopacachi) or at a residential address, then please select our central meeting point: WILD ROVER - CALLE COMERCIO 1476 as your pick-up location. Get Copacabana done in just 5 hours or stay as long as you want… Why not even stay a night on Isla del Sol. See our bus float across the incredible Tiquina stretch. Discounts on food, accommodation, tours and more. Amazing loyalty discounts on Peru Hop buses from Cusco to Lima. Now you’ve enjoyed Copacabana, the beautiful town on the highest lake in the world, it’s time to move on to Cusco, the enthralling city famously known as the gateway to Machu Picchu. Full of culture and history, Cusco is a city not to be passed through quickly. During this part of the journey there is a Peru/Bolivia border crossing, where our guides will assist you with the necessary paperwork and immigration processes for crossing. Check with our office before departure for nationalities that may require additional VISA requirements. Please have your passport and immigration slips in order. Overstay fines should be paid before leaving. Once over the border, we will have a quick dinner stop in the charming center of Puno before the overnight leg from Puno to Cusco. 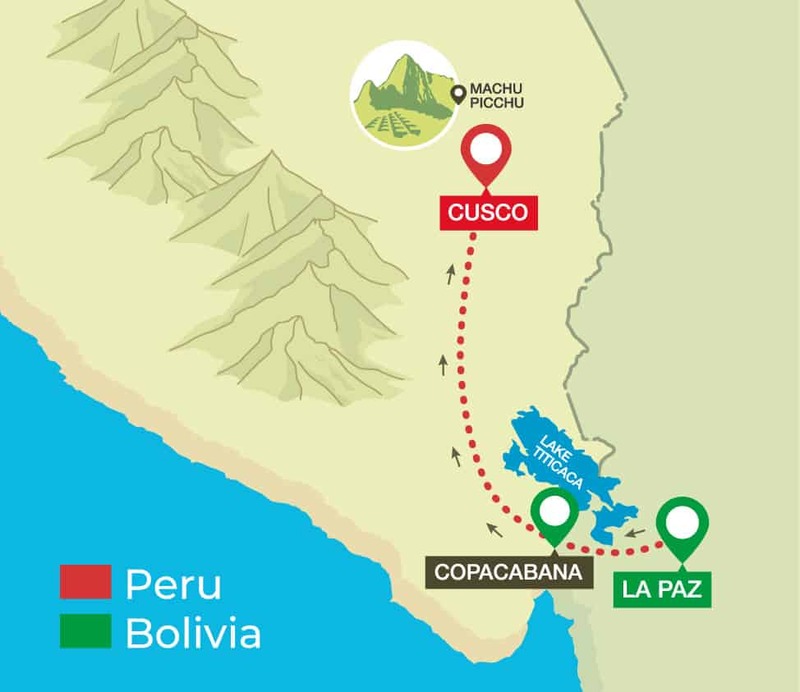 Machu Picchu: Do either a trek (Classic Inca Trail or Salkantay), or maybe a combined trek/biking tour (Inka Jungle Trek) or take the train in and back (can be done as a full day but 2 days staying the night before in Aguas Calientes is advised). We recommend staying 3-4 nights in Cusco (not including nights allocated to touring/trekking Machu Picchu). There are many interesting, culture-based activities to do in and around Cusco. 3-4 nights is the perfect time to try a few of the different activities before moving on. For legal reasons, big buses cannot drive in the historical centre of Cusco. Peru Hop Private Terminal is the drop off point. Click here to view map. MAIN ACTIVITY IN CUSCO: Machu Picchu and Sacred Valley Tours and Treks.